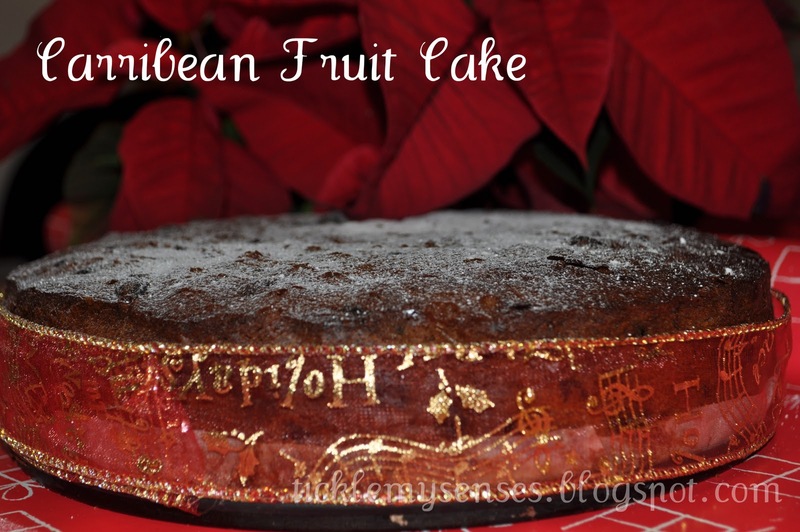 Tickle My Senses: Caribbean Fruit Cake for Christmas!! 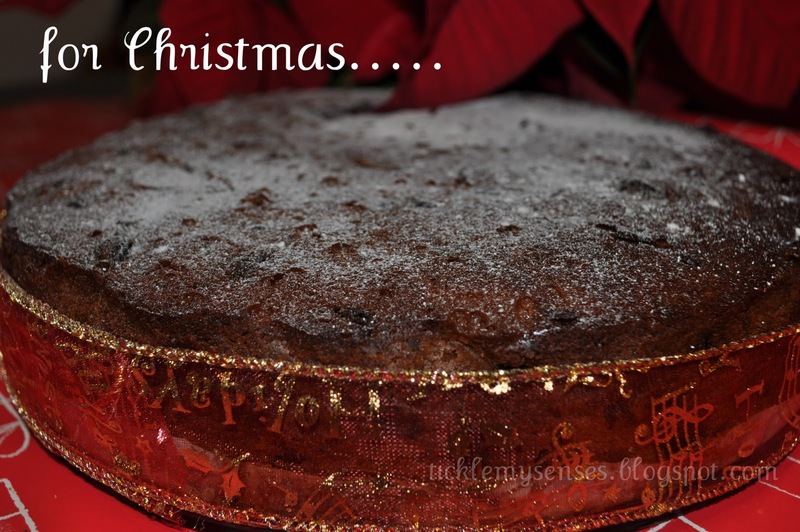 This Christmas Cake recipe was first posted in December 2011. It has been reposted again this year as it is a really good cake. For Christmas this year I have chosen to make an exotic fruit cake. 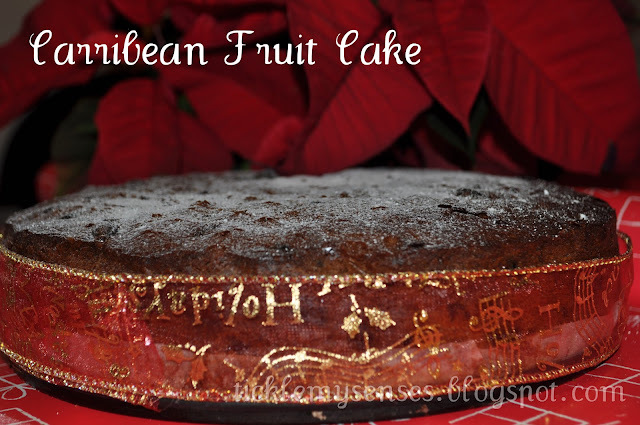 Not the regular every year Christmas cake but a prize winning one with a Caribbean touch. This cake was made and presented by Kirstie Allsopp at Devon County Show, and it won her first prize. She was given the recipe by cookery teacher Rosie Davies of Cooking with Rosie. Why not make this year's Christmas special by sharing this lovely fruit cake with your loved and dear ones. Well since I originally posted this recipe in the last week of November, I have managed to make this cake. I now present you with some images of this beautifully moist and scrumptious cake. I must admit that I did adapt the original recipe to suit me and have made a note of all the adaptations in the recipe below. As I had my fruits soaking in rum since the past couple of weeks I decided to skip the step of heating the fruits in the alcohol as the original recipe recommended. I also added some apricot jam to the fruits to give it a new dimension of flavour. As I couldnt resist the temptation of trying out this cake....and my curiosity got the better of me, hubby and myself tried a small piece. 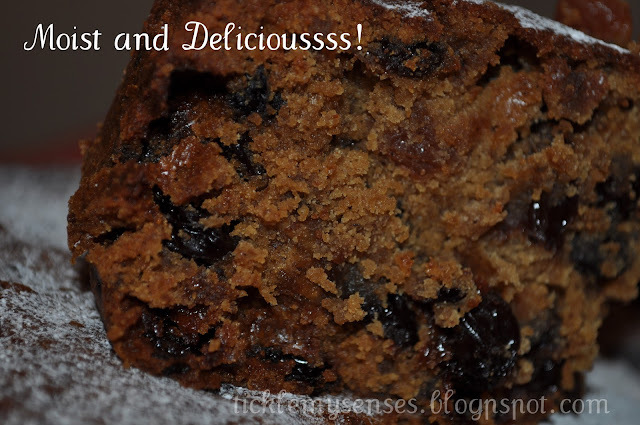 I must say this cake is spicy, fruity, moist and delicious...true to its word. Every bite is loaded with plump fruit. 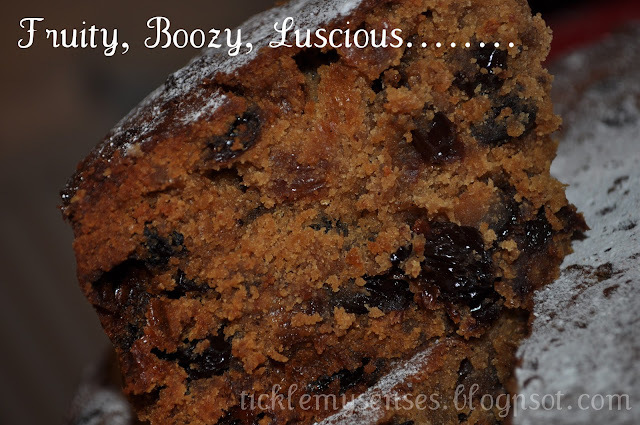 If you are one that doesnt like a lot of fruit in your christmas cake then this recipe is not for you. I will continue to feed the cake with more rum weekly right upto Christmas, just to keep in moisture and spirit high!!...........hmmm. For those of you looking for the original recipe here it is. This recipe is a sure keeper! Approx. 6 tbsps rum to pour after cake comes out of oven. 1. If your dried fruit is not prewashed, wash it all thoroughly, then chop up the larger pieces so they·are about the size of the sultanas and currants. Dry the fruits and then soak all the fruits and nuts in rum or alcohol of your choice. Add the jam. Mix well. Fill the fruit into an airtight bottle, and keep in the fridge for a week ( I soak for a month) before baking the cake, however if you are short on time, then take the fruits add the alcohol of your choice, bring to a gentle boil and simmer for 2–3 minutes. Set aside and allow to get cold. The fruit should absorb all the liquid. 2. Preheat the oven to 150°C/Gas mark 2. Line a 20-cm cake tin with two layers of grease proof paper, making sure the paper around the sides goes about 5cm above the rim of the tin so that none of the mixture escapes as it rises. 3. In a large mixing bowl, cream the butter and sugar with the finely grated zests of the orange and lemon. Pour in the beaten eggs and mix well. Sieve the flour with the mixed spice and ground nutmeg and fold into the egg mixture. Now stir in the soaked dried fruit and chopped nuts. Add the honey, the juice of one lemon or orange and milk as much as required to produce a mixture that has a soft dropping consistency. 4. Spoon the mixture into the prepared tin, smooth the top, then make a shallow dent in the middle so that the cake will rise evenly as it cooks. 5. Wrap a thick layer of brown paper or newspaper around the outside of the tin – as high as the lining paper – and secure with string. Place the tin on a baking tray lined with more brown paper and bake for 3 - 4 hours. Check the cake halfway through the baking time – if the top is getting too brown, cover it with a piece of brown paper. 6. Check the cake is cooked by inserting a skewer in the middle – it should come out clean. Remove the cake from the oven, prick it all over with a fine skewer and carefully pour the 6 tbsps of rum into the holes. Allow the cake to cool completely before removing from the tin (usually around 2 hours). Keep the cake covered in 2 layers of baking paper and a layer of foil. Feed it every 2 days with 1 -2 tsps of rum to keep it moist and luscious........Enjoy!! Yummy, I'm going to try making this, it sounds delicious. I've never tasted Caribbean food. I'm Sicilian and I'm following you from Rome, Italy| Have a nice weekend! I like your recipes. I love the sound of this cake. Makes me think of the sunshine. What a fabulous cake this must be, I like the ingredients. Thanks a lot for visiting my blog and posting your wonderful comments. You have a beautiful blog and the cake looks simply mouthwatering. Glad to follow you. looks soooo delicious. Can I get some shipped to canada?